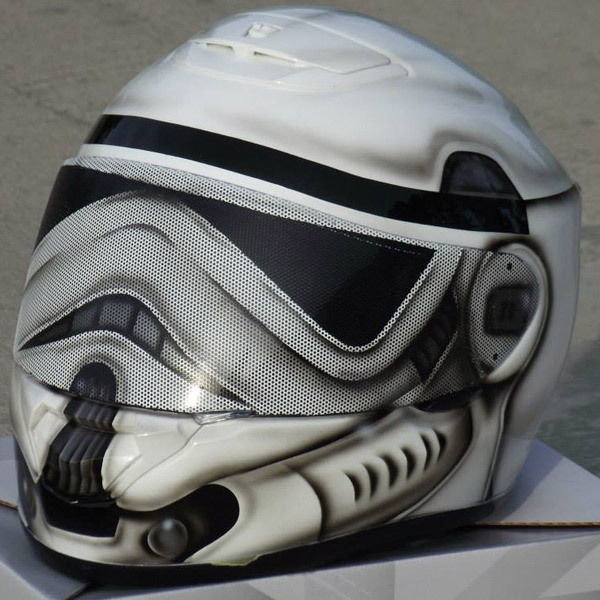 Turns heads, with this unique custom airbrush painted Storm Trooper full face motorcycle helmet and see through visor! The helmet will be a new DOT approved Z1R Phantom just choose your size. Premium automotive paint is used on all helmets, sealed with high build urethane clearcoat. The helmet remains fully functional and visibility is compared to a tinted shield, not recommended for night or rain riding. The perfect blend of style and function, the Phantom sets a new direction for others to follow. From the flowing clean lines to the functional venting system and no-tool quick release shield mechanism, every detail has been refined to maximize performance and comfort. It’s whisper quiet on the highway and the comfort and fitment are superb due to the multi-density padding and plush interior. Simply stated, the Phantom.